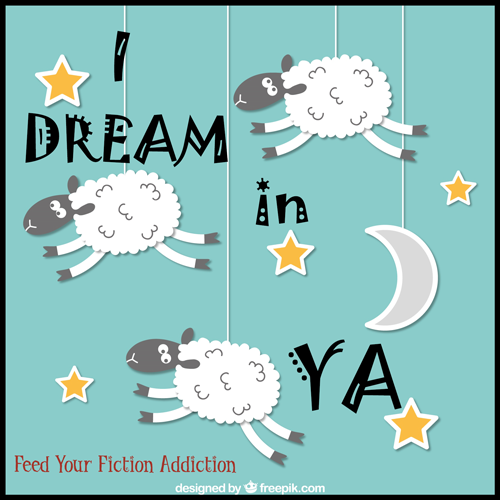 I Dream in YA – Let’s Discuss! Even though I’m 42 years old, I’ve noticed a strange phenomena – I often dream that I’m still in high school or early college! One recurring dream that I’ve had pretty much for as long as I can remember is that I’m in a ginormous school and I can’t find my locker – I wander aimlessly down the halls, going up and down stairwells, searching for a locker I should be able to find, with no luck. After I had my first child, I had a variation of the dream where I left my son in a random bathroom in my high school (nevermind that I’d been out of school for many years) and couldn’t find my way back to him. My subconscious was telling me that not only was I not going to be a very responsible parent, but I also had the maturity of high schooler still. High five, subconscious! Thanks for the vote of confidence. Another common recurring dream for me is that I realize it’s the end of a school year and I haven’t attended class all year (either a single class or pretty much all of them) – I have to take finals that I’m going to fail. Often, the reason I’ve missed this class is because I’ve been suffering from some form of extreme depression and I’ve holed myself up in a cubby somewhere – a strange school attic or some other place. I can’t seem to face the world, and the prospect of failing a final just adds to my depressed feelings. But lately, since I’ve been blogging, I’ve found that my dreams often mirror something akin to a YA novel! I often dream up YA romances where I’m the lead (often, I’m not really me, but I’m seeing the world through some random YA MC’s eyes). I’m living out an angsty YA romance where I so want the boy to like me, but he’s with another girl or some other random YA trope is keeping us apart. 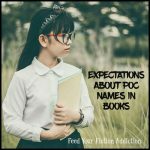 I also often dream in YA Fantasy – I often wish I would have written my dreams down because they’d actually make pretty amazing book plots – unfortunately, I can’t remember any of the really good ones in any sort of detail anymore. Last night’s dream was a YA time travel story – I had to repeatedly go back in time to try to stop some sort of bomb from going off and blowing up my high school. Along the way, I managed to fall in love with a boy who went by his last name (which was Ellory, I think). He had a kind-of-sort-of girlfriend, but she wasn’t in the dream much and they broke up early on and we started dating. His best friend was dating a snotty girl named Sarah who I hated. But Sarah actually eventually ended up being my friend in later iterations and knew about the time traveling. In the end, right before I woke up, I realized that I had finally stopped the bomb, and I was so happy – and then I discovered that Ellory was happily dating Sarah in this new timeline (and his best friend was dating Ellory’s ex)! I find it humorous that I so often dream in YA. You’d think my brain would have figured out by now that I’m well into my adult years. But I guess, considering how much YA I read, it’s not that odd that my brain’s a little confused! Do any of you dream in YA? Do your dreams seem like YA novels? I want to know! It’s so annoying, because I never actually remember my dreams! I probably do dream things along the lines of books I’ve read though, and the way I come up with plots for the novels I (attempt to) write is by basically imagining myself into novels, so I definitely daydream about essentially being in a YA fantasy novel (where I’m generally much tougher and cooler than I am in real life!). Dreams are fun, right? Supposedly, they tell us a lot about a person, but I don’t want to know what my dreams say about me. LOL! I guess our subconsciouses want us to be young again! 🙂 I DO think that my dreams come from reading YA – so many of them are really similar to YA books! My brain apparently forgot that I grew up and no longer have to worry about missing classes. Sometimes when I wake up, I actually have to remind myself that none of it is true – I’m WAY past school age! LOL! Haha, I love your last dream. You managed to write a whole YA novel in your sleep…now you should consider getting it published! And you should keep Ellory as a name – it’s weird enough for a YA book ;). I don’t dream in YA – I dream in TV. From Law & Order to C.S.I. to Supernatural to Bones…I think I’ve dreamt of any single character of my favourite shows past and present. Most of the times, I’m friends with them, and from time to time we try to save/help someone together. But like you, I’m always much younger than my age (sighs). No, not that creepy – they are strangely comforting, since in them I happen to be friend (or even colleague) with all those guys who work for mantaining justice, and who I am so fond of ;). I love this!! I don’t remember my dreams at all. I wish I did though I am sure they would be very similar to what I am reading which is a lot of YA! I think I daydream in YA sometimes though. Fun post!! This is so interesting! Some of your earlier ones sound familiar – I hear people often have these type of dreams. I know I’ve had the “can’t find my locker” and “didn’t attend a class all year” ones before. haha It’s funny how we tend to have such similar dreams with other people! Yes, it’s really interesting. I guess the fact that so many people have the same dreams means there MUST be something to the whole dream interpretation theory thing, right? If it was completely random, we’d all dream really differently and we certainly wouldn’t have such similar recurring dreams! Aw, no fair! Actually, think that happens to me a lot in dreams too – just before I’m about to get the guy, I wake up! Oh my goodness, I sometimes have dreams about being in high school too! It’s always so weird. I’m dying of laughter at the dream about leaving your son in a bathroom somewhere, haha. It’s probably not funny to you in the dream, but it’s funny to me reading about it. I never have recurring dreams, but I know I’ve had some dreams in which I didn’t know my schedule and just didn’t know where to go, or I was so late that I figured I might as well just skip the whole class, or I hadn’t done any of the HW like all year and all the sudden it was due or there was a test and I was going to fail or get in trouble. I’ve never had dreams that were like the plot of a YA novel though, so that’s really funny. I love the time travel one! That does sound like a legitimate book lol. Ooh, this is so interesting! I hardly remember my dreams but when I do, they all take place at the current age I am at. I’ve never had (well, better word is *remembered*) dreams in the past nor future. Because I am a young adult, all my dreams have–of course–taken place in YA. I don’t think I’ve had any book-related dreams before though… not that I recall, at least! I guess that makes sense if you’re in the YA age bracket – I don’t remember dreaming that I was a little kid when I was actually a teenager, and it’s hard for our brains to imagine adulthood when we’re younger! You’re really good at remembering specifics from your dreams! Do you keep a diary? Maybe dreaming about teenage years is a combination of reading a lot of YA and your own kids reaching that troublesome age? I don’t really believe in “meanings” of dreams, I think they’re the result of our subconscious doing a little spring cleaning upstairs and dealing with things we might not be aware of (our worries and such). I don’t keep a diary, but I should. It would be fun to see all the dreams I’ve had over the years! I wish I remembered my dreams. The ones I do remember are usually more like horror novels than YA novels. I actually had high-school-related nightmares for 2 years after I graduated, but then they went away and never came back. Now I’m not sure what I dream about. Glad you got rid of those schoolish nightmares – it’s silly that my brain hung onto them for so long! Wow. Those are some complex dreams! I very rarely remember my dreams and if I do I usually remember small tidbits of the overall storyline. I have tons of high school and college dreams though, and they tend to revolve around me getting to the end of the school year and not having gone to a class for an entire semester that I completely forgot about! And then I don’t graduate. I sometime go look at my college degree to make sure I did, in fact, graduate. Lol. I also feel like I’m ageless in my dreams. I’m not me now, but maybe me in my 20s. Isn’t the brain weird? Yep, that’s the dream, but for me it’s often in high school rather than college – apparently my brain is stuck in adolescence. LOL! I know the feeling of waking up and feeling like the dream might have been true too. Or sometimes, while I’m in the dream, I’ll think, “Oh, this is just like that recurring dream I have sometimes, but THIS time it’s real! !” LOL! Okay Nicole, I am officially creeped out. I have the SAME end-of-semester dream on the regular! And then I end up having to STAY at college, when all I wanted to do was come back home, and I have nowhere to live because I was supposed to graduate! So I suppose yes, I definitely dream in YA too- but super weird that we have the SAME dream! We really ARE meant to be friends 😂 I also have a LOT of dreams about my high school swim team, so that’s weird hahah. Also, I feel like you should WRITE the book in your Time Travel dream! True story, one of my WIPs is from a dream- which was basically a YA novel too! LOVE this post!! It’s true friendship! I’ve considered writing books from some of my dreams. I need to write down the details soon after (like I did this time), so I can hold onto them better. I love that your book is inspired by a dream! How fun!! THis is so great. I wish dreams were in our control because then you can always end up with the same boy. Yes, it would be nice if we could force our dreams in a certain direction! Sometimes I can only remember a dream for a really short time, but if I put effort in I can remember them for longer! Awwww I LOVE this post and so many of your dreams! My dreams feel so vivid and real that it honestly feels like I’m there, and I can remember so many of the details. I don’t necessarily dream in YA because about half of my dreams usually relate to the current book I’m reading whereas the other half relate to what’s going on in my life. While reading Angelfall my dreams were about those ‘monsters’ and I was trying to do what Penryn does near the end of book 1…..it was terrifying and I’d wake up gasping. My husband would be like why in the world are you reading that book?! Lol. But in my dreams I’m always me, so that’s interesting that you’re looking through someone else’s eyes sometimes. We should really keep a notebook of our dreams, I bet we’d laugh at them when we’re in our 80s lol! Yes, I think it would be really fun to write a dream journal and look back on it for years to come. It’s actually a great idea! The dreams I remember (which I rarely do) often attempt to have some sort of YA novel plot. But my subconscious is really messy, and I would never be able to sustain a cohesive storyline like your last dream! I too have the “can’t remember my locker number” or, a college version, “can’t find my dorm room at the start of the new year” dream. And sometimes the “forgot to go to classes and now it’s time for the final” dream. I also have a lot of dreams set in the house I grew up in, which my family left in 1990. And I dream frequently about the girl who was my best friend in high school, even though we lost touch years ago. Something about those early impressions just stick with us. Oh no! I think I’m the only person who hasn’t had an accidentally naked dream – my subconscious has spared me from that one! I always have found dreams interesting. I do dream about high school sometimes or about my previous house. But not always am I aware of my actual age, so not sure how often i dream in YA. I do have themes that recur often, like not being able to find the toilet or small trains or I have to go somewhere, but everything is taking me so long I know I am going to be late and I feel rushed the entire time. I also have those types of dreams where even in the dream I realize they would make a great story. I used to write down my dreams, but most of the time the story seemed better when dreaming. My most recent one was were I was character who recently had gotten empathy and I could hear everyone’s thoughts and emotions it was super overwhelming. It was cool to be able to communicate with water plants (on which the empathy worked as well) and there was a lot of water, like a big swimming pool or zoo type aquarium in which also humans swam. And I was a white tiger shifter, vampire and merman at once, which made no sense to me when I finally was awake. And there was something with a snake bite and I was a doctor as well, lol. Your time travel dream actually sounds pretty interesting and like it would make for a good story. Yeah, most of the times the dreams don’t make a whole lot of actual sense once you wake up – though they seemed completely logical at the time. I mean, why wouldn’t you be a white tiger shifter/vampire/merman/doctor? I think it makes more sense that you dream you’re your own age – I’m probably the weird one here. I definitely dream in fantasy sometimes, but I’ve never written a dream down, so now all the details have flown away! Another fun post, Shannon! Seriously, you come up with awesome stuff! Yay! 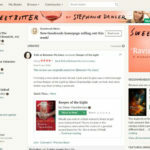 So it works the same for you, but the historical romance is just what sticks in your brain better – I think dreaming in historical fiction would be awesome! I definitely don’t remember them all the time, but I remember enough of them to realize the YA patterns! Haha, this is so interesting! I don’t remember my dreams that often, but when I do, sometimes it’s a YA novel and other times it’s more of a weird thriller xD But I usually dream at my age. 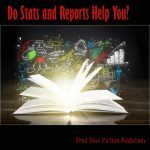 Maybe you’re right – reading choices could affect your subconscious! Cilla recently posted: [Match Made in the Pages] Set Neville Longbottom Up on A Blind Date! 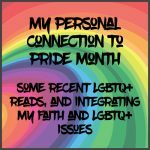 Nicole @ Feed Your Fiction Addiction recently posted: July Wrap-Up Round-Up Giveaway!